PJAMM’s September 2017 Pikes Peak Climb -- A Success!!! This may be the most coveted cycling photo-op in the US. The Pikes Peak cycling climb in the Front Range mountain range, part of the Rocky Mountains in Colorado, is one of the most incredible climbs, period. This mountain is easily one of the most famous in the country, and even in the world. Every year more than one million visitors travel to Pikes Peak; after Mt. Fuji in Japan, Pikes Peak is the second most visited mountain on earth. The views are indescribable and unmatched -- it’s no wonder Katharine Lee Bates was inspired to write “America the Beautiful” after taking in the beauty of Pikes Peak’s summit (Come to Life Colorado). Epic: That's the best way to describe this one. An absolute MUST DO for any cyclist who lives to climb. We have been to hundreds of climb tops, summits, passes, cols, and more, and this is surely one of our favorites. Why? 1. It is a punishing ascent -- there’s no dispute about that. For the ten miles from Mile 14 to the summit, we ascend from 9,700’ to 14,115’, gaining an impressive 4,300’ at a challenging 8.8% grade. That’s a tough go, even without accounting for altitude. 2. The Pikes Peak cycling climb is tremendously scenic. It begins in Manitou Springs, CO, a quaint town founded for its mineral springs, and travels through heavily forested National Park land until opening up to clear views above the treeline at approximately Mile 18.4 (29.6 km) at about 11,500’ (3,505m). Surrounded by forest for the first 3/4’s of the climb. 3. Breathtaking views of bold Colorado mountains in the distance, and vistas of the Colorado plains thousands of feet below, lie unobstructed due to the steepness of the mountain and being above treeline after 11,500’/3,505m. Amazing views east towards Manitou and Colorado Springs. Greatest hairpins in the U.S.
the Tourmalet West of the United States. 5. Nearly 8,000’ (2,438m) of straight climbing up to 14,115'/4,302m!! In our opinion (also supported by the FIETS Index) Pikes Peak bicycle climb is the most difficult and hardest climb by bike in Colorado. Mt. Evans is a close second, at #11 in the entire United States and Top 100 in the World. #2 highest climb in North America. 2014: Our first of three trips up Pikes Peak. Since it’s Colorado and the second highest paved road in North America, be cautious about the time of year you choose to do this climb. Pikes Peak is open year round, weather permitting. Call (719) 385-7325 and press 1 for Road/Weather Conditions and 2 for Hours of Operation/Admission Rates. We have climbed Pikes Peak by bike three times (July, August, and September) and had no problems in July and August, but were nearly snowed on in September. Train as much as you have ever trained for any climb. This is a monster and goes to an elevation that will affect you (42% less oxygen at the summit than at sea level). We suggest at least a compact chain ring and 28 to 30t cassette. Start the full climb at the roundabout in downtown Manitou Springs, six miles from Colorado Springs and 90 miles from Denver International Airport ( 38.85928, -104.91966 latitude/longitude). Pikes Peak is the second highest paved road in the Northern Hemisphere (a mere 15’/4.6m below #1, Mt. Evans, CO). Cycling on a paved road above 14,000' is simply unparalleled in the United States (and anywhere other than the Himalayas and Andes for that matter). As noted above, Pikes Peak may have the greatest view of switchbacks just climbed of any climb in the U.S. (see slideshow). Depending on how you define a switchback (over 120-180 degrees for our purposes here), there are approximately 14 switchbacks on Pikes Peak above Glen Cove (Mile 17.5/Kilometer 28). There is a set of two giant switchbacks that present our final challenge to reaching the summit: 1.3 miles/2km, 630’/192m, 9.7%. These final switchbacks are reminiscent of the final challenging run up to and final two switchbacks at the top of the mighty Mauna Kea. The history of Pikes Peak is rich. It is one of Colorado’s 53 “fourteeners,” mountains whose peaks are over 14,000 feet above sea level, and is taller than any peak in the United States east of its longitude. The mountain as we now refer to it was named after Zebulon Pike, an American explorer who never summited the peak himself. The Ute Indians called this mountain “Tava,” meaning “sun,” and those who lived in this area were called the “Tabegauche” people, which means “People of the Sun Mountain.” Their traditional stories say they were created on this mountain, though historical records reflect their arriving to the area around 500 A.D. The Arapaho peoples referred to Pikes Peak as "Heey-otoyoo,” or "Long Mountain,” and early Spanish settlers in the area called it “El Capitan,” meaning “The Leader” (Wikipedia). In 1820, fourteen years after the mountain was named after Zebulon Pike, Edwin James became the first European-American to summit Pikes Peak. It was on this trip that he first discovered the blue columbine flower, which is now Colorado’s state flower. A great historical timeline of the mountain can be found at Pikes Peak, America's Mountain. Not a problem, unless you are on a diet! 1. The first opportunity to refill/refuel is at the Crystal Reservoir Visitor Center at Mile 12/Km 19 (fudge, candy, chips, gatorade and water). Minimal “healthy options,” but the fudge is good, trust us! 2. The Glen Cove Inn at Mile 17.5/Km 28 will have everything you need, from water to a full meal. 3. The visitor center/cafeteria at the summit has cafeteria-style food: cheeseburgers, french fries, and something very special and tasty -- the only donuts made above 14,000'/4,267m! You will enter and/or pass through four of the six life zones on your climb. These life zones are generally defined in part by the plants and animals inhabiting them, and due to the length of this ascent, the flora and fauna do change drastically throughout the climb. The four climate zones you’ll experience along the way to summiting Pikes Peak are: the Foothills Zone, the Motane Zone, the Sub-Alpine Zone, and finally the Alpine Zone. An in-depth explanation of each of these four life zones can be found here. 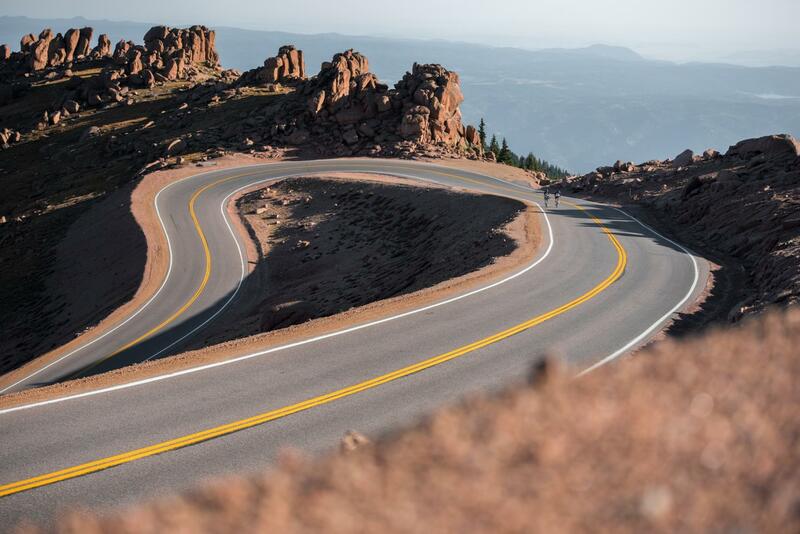 Pikes Peak cycling is as high as you'll ever get in North America, so be prepared. 3% less oxygen for every 1,000'/304m of climbing (42% less oxygen at 14,000’/4,267m than at sea level). It is highly recommended that you climb a few of the lower peaks in the area before tackling Pikes Peak. Visit Colorado Springs’s website offers a list of eleven bike routes in the Colorado Springs area, ranging from beginner to advanced, which could be a good tool as you acclimate to the altitude. On my second climb day in Colorado, I ascended Mt. Evans (14,130') and was having serious processing and cognitive issues above 13,000'/3,962m, but those problems were not as bad my fourth Colorado climb day when I tackled Pikes. The weather associated with Pikes Peak cycling can change in an instant on the mountain (as on so many other summits that approach this height) and it can snow at the top, even during the summer! We have done the Pikes Peak bike climb twice: First in September, 2014 -- we reached the top in decent weather, but after spending 30 minutes or so in the Visitor Center (three cheeseburgers and a donut take some time, after all! ), the weather had turned and we encountered fairly significant snowfall on the ride (in a car, thankfully) down the first few thousand feet from the top. Fast forward to August 9, 2015. The wind chill had been 35F/1.66c at the top in the afternoon of August 8th. We had no support on this one, and stocked up on thermals (tights/jacket/vest), windbreaker, thermal jersey, all the extremity coverings money can buy and one big backpack. Problem was. . . the weather didn’t change, so the five pounds of clothing packed up (and packed down) was not necessary. We had perfect weather for our climb in August, 2017. You can get some great weather or . . . However, we strongly encourage you to always assume the worst at the top. Check the 48 hour weather forecast via National Weather Service - Pikes Peak Summit and also the current comparison of Manitou Springs to Pikes Peak Summit offered by the Cog Railway - Weather Comparison.
. . . not so great weather . . . It had been a nice Fall day at the bottom . . . many hours past . . . If you don’t want to deal with highway traffic, begin the climb after that 4 mile/6.4 km stretch, at either the park entrance (mile 6/10 km of the full route), or maybe the large Santa’s Workshop Amusement Park parking lot at mile 5.5 / 8.8 km, just shy of the Park Gate). From the park entrance: 18.2 miles/29 km, 7.5% average grade, 6,462’/1,969m elevation gain and FIETS of 16.04; STILL the #5 U.S. and a Top 20 World Climb. Full climb: is 24.2 miles/38.9km - 6.5% - 7,914/2,412m - FIETS 17.67. Descent: The speed limit on Pikes Peak is 25 mph. The traffic on the mountain can be very heavy during peak hours (9:00-5:00) and particularly on weekends. Often, during peak hours, we will inch down the mountain behind painfully long and slow lines of traffic (particularly slow along the switchback sections above Glen Cove Inn). Events: There are several Pikes Peak races during the year (cycling, running, downhill skateboard, auto race, etc. ), so be sure to Google the date you are going to determine whether there will be road closures and/or delays. We were delayed by events in 2014 (longboard skateboard) and 2015 (bicycle race, but PJAMM participated in that, so no complaints there) on the weekends we chose to climb the mountain -- bad luck for the old non-racer, for sure, but hey, who’s complaining about a little rest time on a climb like this! Longboard event from our 2014 trip to Pikes Peak. Fees - $15 to enter the park, and they will track you down if you hop the gate before it opens in the wee hours (trust us, we know!). Cycling Pikes Peak is the greatest bike climb challenge in Colorado and one the the most difficult in the US (#4) and World (#19).